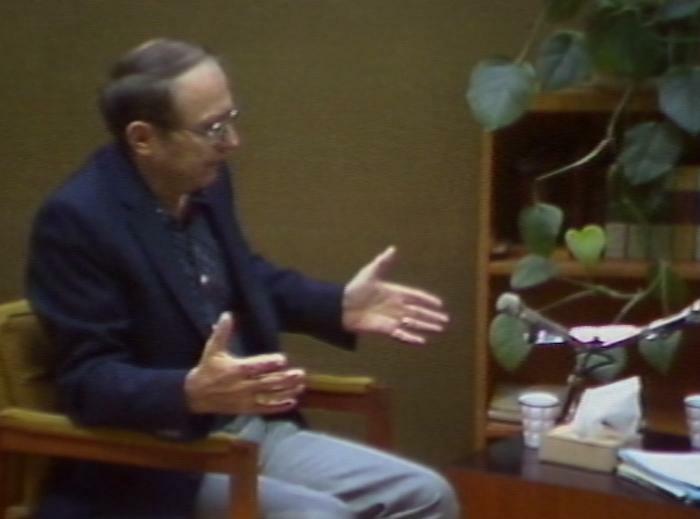 Still image from David E. Holocaust testimony, September 28, 1983. SynopsisDavid E. was born in Gherla, Romania on October 26, 1926. He was one of five children. He recalls his large extended family with a long history in the region. He describes the Jewish community. He describes the Hungarian occupation in 1941 and increased antisemitism. He recalls the increased militarization of the area and his family’s forced evacuation. He describes deportation to a ghetto. He describes deportation to Auschwitz after four weeks and the selection process. He recalls being separated from his family. David recounts survival advice given to him by Polish Jews who had been in the camp longer. He recalls volunteering to work as a cabinetmaker in a factory, which ensured his survival. He discusses regret about leaving his brothers behind in the camp. He recalls receiving assistance from a German officer and making friends with a co-worker. David describes the death march in 1945, transfer by train to Mauthausen, and later Melk. He recalls being evacuated by German troops from Melk to Ebensee, where United States troops liberated the camp. David describes returning home and his union with his sister. He discusses joining a Zionist group in preparation to move to Israel but deciding to go to Paris instead. He describes immigration to Canada in 1947 with assistance from the Canadian Jewish Congress as a war orphan. He describes establishing a life in Canada and helping his sister and her family move. David discusses the importance of family and community. He discusses sharing his experiences once with his wife but not with his children.